Close by were two neolithic pits containing pottery worked flint, deer antlers and animal bones, dating to between 4000BC and 2000BC. A series of three burials were also found close by, dating to around 2000BC. 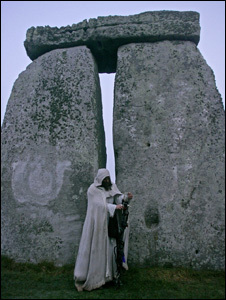 The stone remained a focus of activity right down to Romano-British times, and a small square wooden building – most likely a shrine – was built immediately to its southwest. Coins and pottery found in the ploughsoil date this to between 200AD and 400AD. The other readily accessible sarsen is the Bulford Stone which lies in an arable field east of Bulford Village. It’s rather larger than the Cuckoo Stone at 2.8m long and again the excavation evidence shows that it too was once stood upright next to the hollow in which it formed. It’s also closely associated with burials from the neolithic, the pottery found here dates to between 2300BC and 1900BC. The grave goods found were remarkable, including a flake of transparent rock crystal from either South Wales or the Alps and a “mini megalith” carved from a piece of limestone. Lying in the northern ditch of a badly degraded long barrow within the Salisbury Plain military training area (and therefore not accessible to the public) are three more sarsen boulders. They vary in size and – being half buried in the turf – are difficult to see, but the largest seems to be almost 2m long. This long barrow was excavated by John Thurnam in 1864 who found an early neolithic burial on the original ground surface and an later Beaker burial just below the top of the mound. Subsequent digging by the military in the early 20th century has almost obliterated the barrow but its outline can still be made out. There is some debate about whether the sarsens lying in the ditch were originally part of the structure of the long barrow or if they were dragged there by farmers clearing fields at some later date. The stronger possibility is that they were part of the structure. Perhaps there are still more to be found. Certainly it seems that sarsen boulders of “large” or even “immense” size are not unknown in this part of Wiltshire so maybe the idea that the sarsens of Stonehenge were brought from the Marlborough Downs shouldn’t be accepted at face value. Curiously the Cuckoo Stone, the Avon Sarsen and the Bulford Stone all lie precisely on a straight line, with the Avon Stone being 1500 yards from the Cuckoo Stone and 1450 yards from the Bulford Stone.